Interrelationship among organisms and evidences of evolution, morphological evidence, homology and analogy, vestigial organs, physiological, embryological, palaeontological (fossils) and biogeographical evidences. Vestigial organs, Atavism, Homologous and Analogous organs, missing links (Archaeopteryx) and connecting links; physiological evidence (serology), Darwin's finches. WE HAVE GIVEN THEORIES FOR EVOLUTION... 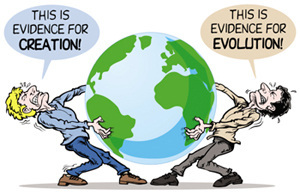 HERE WE STUDY THE EVIDENCES OF EVOLUTION. According to the theory of evolution, all present day organisms have evolved from simple forms that existed in the past. Despite the diversity in organisms, all living beings exhibit basic unity in both structure and life processes. This indicates that all living organisms have evolved from a common ancestor. Similarities can be seen in structural organisation. Different types of cells also have same basic structure with same organelles. The macromolecules forming the protoplasm is also similar in all cells. all living organisms obtain matter and energy from their surroundings. to maintain life all living organisms use energy to synthesise new compounds for growth. all organisms grow and reproduce. All these similarities indicate that organisms have evolved from one common ancestor. This is called Monophyletic orgin. this process has occurred resulting in more than a million species from one common ancestor and is described as "descent with modification". first organisms to appear were unicellular. Multicellular organisms evolved from the unicellular organisms. The earliest organisms were simple forms and gradually evolved and became complex organisms. This is supported by evidence from different branches of Biology. Structures that are embryologically similar, but have different functions, are called homologous structures. They have different appearance, perform different functions but have common origin and same basic pattern.This phenomenon of similarity between organs of different animals having common origin is called Homology. carpals, metacarpals and phalanges), muscles, nerves and blood vessels arranged on the same pattern. The existence of homology in the structural plan of limbs of vertebrates can be explained on the basis that all of them have evolved from common ancestors. Thus, homology in structural organisation provides a convincing evidence for the concept of descent with modification. Homology in structure of heart- The heart is two chambered in fishes, with one auricle and one ventricle. The auricles receive blood from the entire body and ventricle pumps it to the gills. In amphibians and lower reptiles, the heart is three chambered. There are two auricles and one ventricle. The oxygenated blood from lungs is collected in the left auricle and deoxygenated blood from rest of the body in the right auricle. Thus the oxygenated and deoxygenated blood are stored separately. However these get mixed in the ventricle while being pumped to the body organs. In higher reptiles, birds and mammals heart is four chambered and the oxygenated and deoxygenated blood are completely separated. This presents a gradual modification in the heart of vertebrate series while the fundamental structure of heart remains same in all the groups. Mouthparts in insects also show homology, the basic structures of the mouthparts are the same, including a labrum (upper lip), a pair of mandibles, a hypopharynx (floor of mouth), a pair of maxillae, and a labium. some structures are enlarged and modified while some are lost. In cockroach and grasshopper the mouth-parts are modified for biting and chewing, they have strong mandibles and maxillae for manipulating food. In mosquitoes mouth-parts are modified for piercing, the labrum and maxillae form tube and mandibles form piercing stylets. In housefly and butterfly the labrum is reduced; mandibles are lost and maxillae becomes long forming sucking tube. Thorns of Bougainvillea and tendrils of passiflora are homologous structures. These are modified branches and are located at the same position and serve the function of helping in climbing. Phyllode of Opuntia, phylloclade of Ruscus and cladode of Asparagus are modified stem and carry out photosynthesis. Presence of homologous organs confirms common ancestory and interrelationship between organisms. That individuals from the same group have undergone adaptive divergence. Analogous organs perform the same function and have almost similar appearance, but they develop in totally different groups and have different basic structure. Thus, analogy is the superficial similarity in appearance between organs of different animal groups because they carry out the same function. The wings of an insect (dragonfly), bird (eagle), mammal (bat) and reptile (Prerodacryle), perform the same function of assisting in the flight but differ considerably in their structure. The wings of an insect are just extensions of body wall without any skeletal support, the wings of ptrerodactyle and bat are skin folds supported by fingers and the wings of a bird are modified forelimbs. This shows that these organs have developed to perform the same function in response to the same need but their basic architecture is different because these belong to different groups of animals. A fish, an lchthyosaur and a whale have stream-lined body and are adapted for aquatic existence. However these organisms belong to three different classes of vertebrates with no traces of common ancestry. Leaves of plants and cladode of Ruscus are analogous. These look alike and carry out photosynthesis but the cladode of Ruscus is stem. Analogous organs are developed in the evolutionary process through adaptations of distantly related organisms to the same mode of life. This is called adaptive convergence or convergent evolution. 6 ex- fore limbs of vertebrates ex- wings of bird, bat and insect. Organs that are rudimentary or poorly developed, non-functional or useless to the possessor but were functional in the ancestors are called vestigial organs. From the point of view of descent with modification, the existence of vestigial organs can be explained in terms of changes in a descendant species, perhaps connected to changes in the environment or modes of life of the species. Those organs are thought to have been functional in the ancestral species but to have since become unnecessary and non-functional. Examples: In man--- Nictitating membrane, ear muscles, vermiform appendix etc. Examples of vestigial organs in other animals hind limbs of whales, the haltere (vestigial hind wings) of flies and mosquitos, vestigial wings of flightless birds such as ostriches, and the vestigial leaves of some xerophytes (e.g. cactus) and parasitic plants (e.g. dodder). Vestigial structures, as defined by evolutionists, are body structures that have no function in a present-day organism but were probably useful to an ancestor. Vestigial organs in plants include scale leaves of Ruscus and underground stem. Reappearance or re-functioning of certain ancestral characters after several generations is called atavism.Atavisms are traits of distant ancestors that reappear in the modern day. In order for the trait to be an atavism, an organism's parents can't have the trait, and neither can recent ancestors. The fossils are the preserved remains of animals, plants or their parts found in various strata of earth. 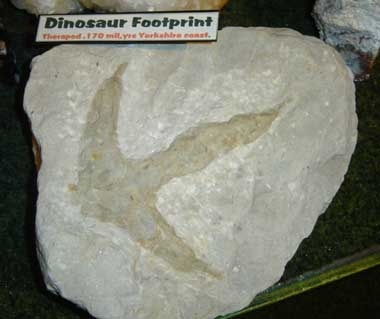 Fossils may be of entire organisms or a part which got buried, a mould or cast, foot prints or imprints of a leaf on a stone. Fossils can result by several methods. However these methods are purely accidental. 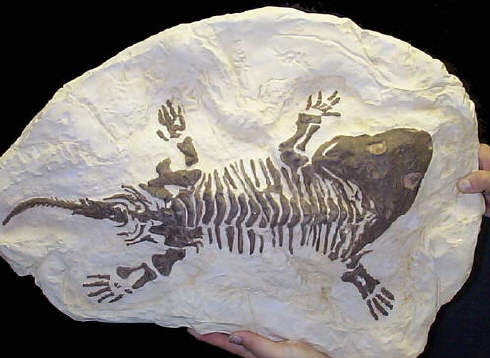 There are many methods of fossilization. 1. Petrifaction :- It is the commonest method. In this method dead and buried organisms turn into stones. This is due to formation of sedimentary rocks under water. While the soft parts disappear due to decaying, hard parts get preserved due to mineralisation. The preservation happens in the original strata. 2. Petrifaction of soft parts :- Under certain conditions muscles and other soft organs may get mineralised and form rocky fossils. Several such plant fossils had been obtained. 3. Preservation of foot prints :- Moving animals on soft mud can leave foot prints. These prints, if left undisturbed, can get hardened and form rocky fossils. A study of such imprints can provide clues regarding the body form and characteristics of the extinct animal. 4. Formation of moulds and casts :- Fossilized moulds are found in volcanic ashes. Several invertebrate fossils had been obtained as moulds. They provide details about the exact physical features of the animal. 5. Fossilization in resins and amber :- Normally, insects get entangled in soft sticky secretions of trees called resin. The dried material can get fossilized. These fossils can even reveal the colour of the organism. Archaeopteryx (meaning "ancient wing") is a very early prehistoric bird, dating from about 150 million years ago during the Jurassic period, when many dinosaurs lived. The fossil was discovered by It is one of the oldest-known birds. This crow-sized animal may have been able to fly, but not very far and not very well. Although it had feathers and could fly, it had similarities to dinosaurs, including its teeth, skull, lack of a horny bill, and certain bone structures. Archaeopteryx had a wingspan of about 1.5 feet (0.5 m) and was about 1 foot ( 30 cm) long from beak to tail. It probably weighed from 11 to 18 ounces (300 to 500 grams). 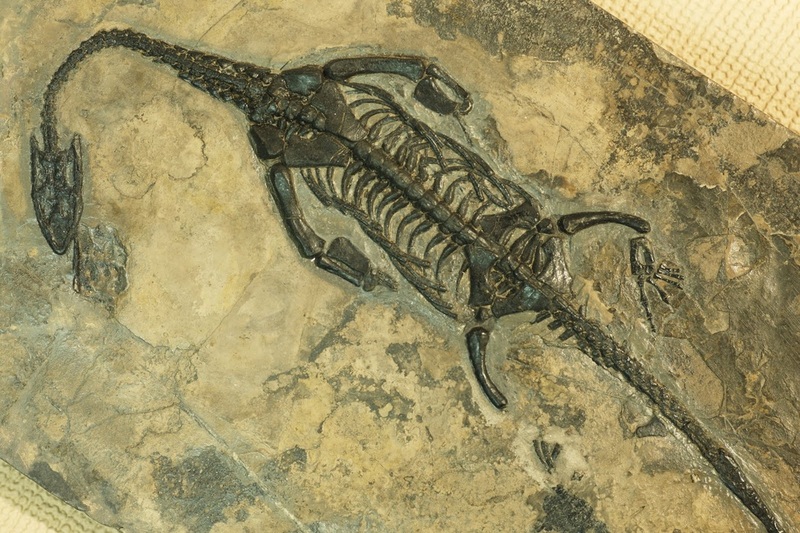 The fossil was discoveredby Andreas Wagner. Presence of teeth in jaws, fingers having claws, long tail with free caudal vertebrae, presence of scales and sternum without keel. Presence of feathers on the body, forelimbs modified to form wings, jaws drawn into beak, presence of V shaped furcula or wish bone, limb bones and girdles are bird like. Pseudomorphs- Casts of bodies of individuals living in the past. Pseudofossils- Rocks showing markings or outlines resembling particular plant or animal structures because of mineral substances. 1.Distribution in successive strata-- when fossils are arranged from old to recent, there is gradual successive changes. These changes show that ancient fossils are simple forms and the recent ones in the upper strata are highly evolved. The highly evolved fossils or the fossils of man are found in the recent rocks. 2.Missing links– These are fossils (extinct organisms) that had characters of two adjoining phyla (groups) and are called transitional fossils. Eg. Archaeopteryx--- link between Reptiles and Birds. 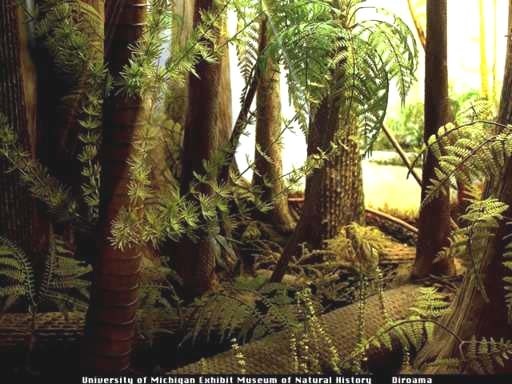 Seymouria– fossils from carboniferous period with characteristics of both Amphibians and Reptiles. Pteridosperms---fossils from carboniferous and Permian periods with characters of Ferns and Gymnosperms. The leaves were like ferns and stem showed secondary growth like gymnosperms. 3.Connecting links-- The present day living organism having characters of organisms of two adjoining phyla (group). These animals establish continuity in the series by proving that one group has evolved from the other. Eg. Protopterus or lung fishes show characters of Fishes and Amphibians, paired fins and dermal scales like fishes and 3 chambered heart and lungs for breathing air like amphibians. Duck billed platypus and spiny ant eater shows characters between reptiles and mammals, Chimaera or rabbit fish between cartilaginous and bony fishes, Peripatus between annelids and arthropods, and Neopilina between Annelids and Molluscs. Mammals and Reptiles- Duck billed platypus. Do not get fossilized properly, destroyed by bacteria, soft bodied animals are not fossilized. Deeper fossils not available, can get destroyed by natural forces. Some destroyed due to lack of awareness by human beings. fossils in the sea floor and in mountains or land covered with jungles cannot be accessed. Otheneil C Marsh described the fossil history of horse. Accordingly it began about 60 million years ago in North America. The ancestors of present day horse were small-sized, fox like forms. These forms gradually changed and evolved into the present day horses. Eohippus, Mesohippus, Merychippus, Pliohippus and Equus. Loss of hair from body. 1 Eohippus dawn horse Eocene 28 cms height, with 4 fingers and 3 toes, molars are short crowned. 2 Mesohippus Intermediate horse Oligocene 60 cms height, with 3 fingers and 3 toes, molars are short crowned. Similarity in early development of animals: All animals start their life cycle as a zygote and develops to form morula, blastula and gastrula. The gastrula shows three germ layers- Ectoderm, mesoderm and endoderm. These germinal layers also develop to form same types of parts in all animals. Temporary embryonic structures– Embryos of certain animals possess temporary non functional that disappear or reduce before birth. 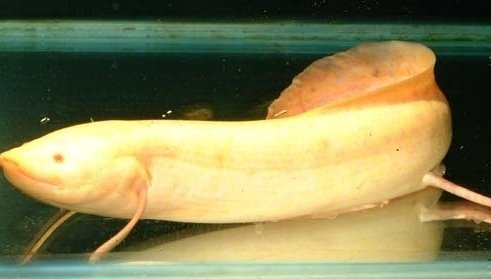 Examples- gill clefts are seen in embryos of all land vertebrates that is not present in adult. Toothbuds are present in embryos of toothless whales and birds, emryos of all vertebrates have notochord which is replaced by vertebral column in adults. Recapitulation theory- This was proposed by Von Baer, and revised and renamed BIOGENETIC LAW by Ernst Haeckel. This states that "Ontogeny repeats phylogeny", an organism during its embryonic development repeats in an abbreviated form the evolutionary history of an individual. Example- Development of frog--- The tadpole shows fish-like characters, gills, tail with tail-fin and lateral line. This suggests that frogs evolved from fishes. Appearance of filamentous protonema during the development of moss and fern. Protonema resembles algae thus suggesting the algal ancestory of bryophytes. The study of distribution of animals and plants on earth surface is called Biogeography. Continental drifts or plate tectonics were described by Alfred Wegener. All the continents formed a single land mass –PANGAEA. This was then divided into Laurasia and Gondwana. Later Wallace, reorganised the realms on the basis of terrestrial and fresh water vertebrates. These realms separated from each other by major barriers leading to changes in climatic conditions. When descendants of a common ancestor inhabit different geographical areas, it is called discontinuous distribution. Example- Great Britain and Japan have similar animal life even though they are separated by long distances. Camels occur in Asia whereas their close relatives, Ilama are found in South America. Some areas of the world have unique organisms not found anywhere else, this is called restricted distribution. The total life span of earth is called geological time. This is divided into different divisions. The majors divisions are called eras. The arrangement of these eras and their divisions is called as geological time scale. This was developed by G.Araduiana. Earth was formed, cooled and underwent changes creating conditions suitable for life. Started before 2000 million years, unicellular animals present. Proterozoic Era- Era of primitive life or precambrian period. started about 2000 million years and extended to 1500 million years. Less fossil record as the animals were soft bodied. Paleozoic Era- Cradle of ancient life. Started 600 million years ago and lasted for 370 million years. Extensive fossil record is present; ancestors of all living phyla were seen. The land plants, the invertebrates and the first vertebrates appeared. Cambrian, Ordovician, Silurian, Devonian, Carboniferous, and Permian. Mesozoic Era-Era of intermediate life. Started 230 million years ago and extended for 63 million years. Also called ‘age of reptiles’ as reptiles evolved, diversified and became rulers of the earth. They occupied the land, sea and air. Divided into Triassic, Jurassic and Cretaceous. Coenozoic Era- Era of modern life. Its duration is considered 63 million years and is still continuing. Also called ‘Age of mammals’ characterized by adaptive radiation in birds, insects and mammals. The monocot and herbaceous plant appeared during this time. 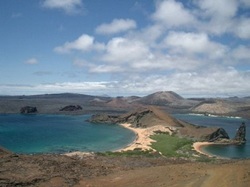 Galapagos islands (22) are chain of islands in the Pacific ocean on the west coast of South America. Darwin studied different species of Finches on this island during his journey in Darwin's Finches (small black birds) that show adaptive radiation. Mainland finches of South America were seed-eating, on reaching different islands their beaks adapted to the type of food available. Living in isolation Finches on each island evolved into a different species. 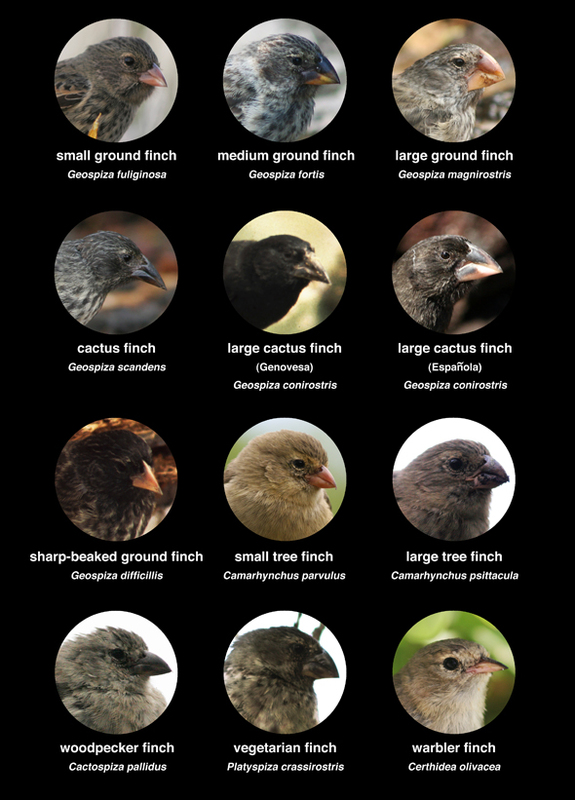 Thus origin of new species of Finches from parental stock adapted to new habitat, this is an example of adaptive radiation. descendents. Extinctions are of two types namely true extinctions and pseudo extinction. In true extinctions a particular lineage totally disappears without any progeny or evolutionary descendents.